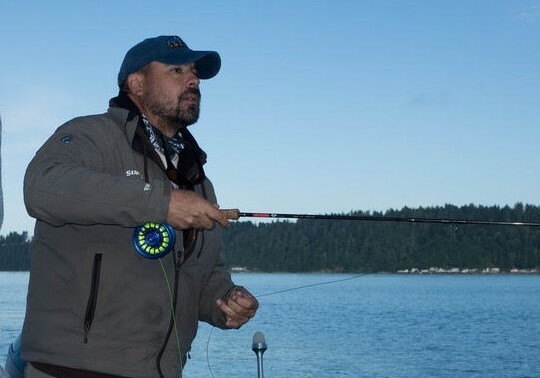 One of the biggest mistakes I see people making when fly fishing Puget Sound is sticking with the same old boring retrieve, regardless of the fly used or the species being targeted. Its very easy to forget about this simple aspect of saltwater fly fishing, but in many cases the retrieve being used can make a huge difference in success during a day on the water. The first thing to consider when retrieving your fly is what type of fly is it; What are you trying to mimic? It’s important, when tying on a fly, to consider what the fly is replicating and how the natural version may move in the water. Take a sculpin for example… Have you ever watched a sculpin swim naturally? A sculpin doesn’t move in a smooth, steady motion, rather it tends to dart around in short bursts. This information is important if you are fishing a sculpin pattern. Instead of falling into the same old retrieve, if one wants to mimic a natural sculpin they would be far better served by trying to copy that sort of short burst when retrieving the fly. Short, quick strips followed with pauses will provide a much more natural presentation than a smooth, steady retrieve. Letting the fly sink to the bottom between strips will often result in a strike as soon as the next strip is taken. The same applies for baitfish patterns…. Baitfish don’t swim in a completely smooth motion, especially a wounded one. By employing a more erratic retrieve you may find yourself receiving more strikes than the standard retrieve. Sometimes no retrieve at all is the best method of mimicking the naturals. Often when salmon are feeding on large concentrations of baitfish they will bust through the school of bait first, then pick off the wounded or dying baitfish as they sink and separate from the school. In these situations it can often be most effective to not retrieve the fly at all, instead allowing it to sink naturally as if it was one of these wounded/dying fish. When fishing shrimp, euphasids, isopods etc to feeding fish during the winter a slow retrieve to mimic the floating food source is often needed to illicit strikes. By taking a second to consider what the fly is imitating and how that particular food source would be moving in the water you will be far more likely to receive regular attention from the fish. Another factor to consider, and one that can be extremely important, is what species is present to target? Are you fishing to sea run cutthroat, coho, chinook, chum etc? Each species tends to respond better to certain retrieves. Coho for example are notorious for liking a fly that is retrieved extremely quickly. They are super aggressive fish in general, and their predatory nature can often be triggered by a fly that is moving quickly. You’re never, ever going to out strip a hungry coho. Chinook on the other hand seem to prefer to target a slower moving prey. Often chinook want to eat prey that is wounded and not moving super quickly, so if you are targeting chinook, or you believe there are some present, it would be wise to focus on a slower, more erratic retrieve. Sea run cutthroat in general seem to prefer a fly moved at a much more moderate pace. Pink salmon respond extremely well to a fly that has a lot of jigging action. When targeting pinks its often a good idea to employ a retrieve with lots of pauses that allow the fly to sink and jig up on the next strip. By being aware of the species you are targeting you can focus your retrieve accordingly and up your chances of success with each species. Another thing to consider is that fish may respond better to certain retrieves on specific days. Some times cutthroat want a fly that is barely crawling across the bottom, other times when they are feeding aggressively they will respond well to a fly that is stripped quite quickly. In almost all cases when retrieving any sort of baitfish pattern an erratic retrieve, regardless of speed, is much more likely to get attention than a steady retrieve. If you think about it, almost nothing swims completely smoothly all the time. A retrieve that gives the fly lots of pauses, with varying speed, will often catch the attention of any nearby fish. Few fish seem to be able to resist a wounded prey. More than anything its important to vary your retrieve so that you can get a feel for what the fish prefer. If you stick with the same retrieve at all times you will often miss out on fish that may be caught by changing up your retrieve. Fish of all species can be moody creatures and often times what worked last time out is not what the fish are in the mood for the next time you hit the water. By varying your retrieve throughout the day you can work to adjust to these moods and find the type of retrieve that will get attention from fish on any particular day. Puget Sound is a constantly changing environment, and the fish are constantly adjusting to these changes. By being aware of the food source you are imitating, the species you are targeting, and being willing to experiment with your retrieve throughout the course of any day on the water you can help to insure that you are also adjusting to these changes and this can seriously up your success rate.